The rebar for the circular structure and its "floors" and "walls" does seem to be a massive amount as well as very thick. Some of that could be the telephoto lens bunching it all together, though. I believe they need that much rebar due to all the ROCKWORK that will be installed on those facilities. I was curious about it earlier, but just realized that they will need to support all the weight of future rock work. I took this video this morning. I'm pretty tall, which has its advantages. I wonder if a lot of this area might be used as a queue/holding area to get into SWL. And all those sign posts are interesting. I'm pretty tall, which has its advantages. Yes, it does. Though I'm the short one in my family. My brother tops 6'9". It's hard to miss either one of us in a crowd. and yes, it was me just being snarky about that other thread. As far a mine cart, I sooooo wanted it to be there, but it's very much not needed bc the theming is already more than i had dreamed it would be on Jan 10th 2016. Now my only issue with DLRR/ROA is that they can't get it open fast enough. Wire forms + magic mud + sealer + primer + several coats of paint and enamel (as many of us know are quite heavy) + tacked on foliage (real or faux) + cantilevered walks and balconies (just a guess) + California codes = lots of rebar. My guess is yes. As will the relatively large area past HB Restaurant. Two more SILA videos from yesterday 5/12/17. Some good close ups of the circular foundation and some vertical steel going up for the MF attraction. Rivers of America and Critter Country. Wood forms going in for more concrete along RoA and a lot of activity texturing and painting the rock work. Also the water level seems to be pretty close to being full. Last edited by Hammer; 05-13-2017, 07:18 AM. >Queue sounds< ...machinery and traffic, then the pleasing strings of a random public domain song... then the sounds of DL guests chattering for a few minutes. Yup, Jay is watching another SILA video!! And hers are sooooo much better than other groups who have been at it longer. She is no-nonsense, not jittery/shaking, no random comments or jokes or sarcasm, pretty freekin clear shots, no fast pans (call me old, but I hate that the most), SILA knows how to pick a sight and lets us savor the visuals. If I want commentary or educated guesses, I come here. This thread and SILA vids pair well together. I took a snapshot from one of the latest SILA videos and circled a few points in the pic. Does anyone else think that these will be the thresholds for doorways? It seems like they are the right width and likely the right height to be level with the concrete floors when they're poured. I know, doorways aren't an exciting detail, but if we know where they are it will help us more accurately guess what everything else around them is. 1:45: Are they using the scissor lifts to hold those wooden frames in place? Or are they just parked there because there is a concrete footing on which to sit, rather than sitting on the dirt? 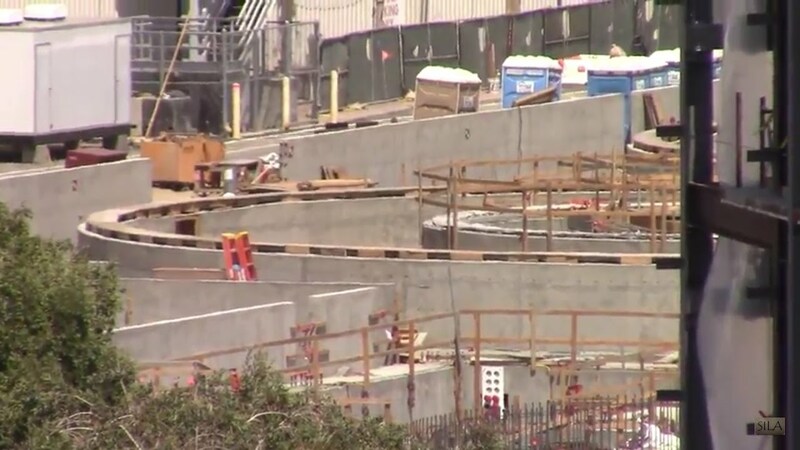 2:25: They are definitely going to be building some more heavy structure above the semi-circular structure (not that you can tell what shape it is, any more) with the pillars running up the center of it. 3:15: We can start to see where they are actually adding real floor supports, in certain areas of the BE building, and which areas may be left open from bottom to top, for view of ride effects or the like. 6:35: There's now a wall for directing guests to their right as they come out from under the DLRR bridge next to the Hungry Bear. It will be interesting to see how they block the view of SWL from the trains (and vise versa) as the trains pass over that bridge and onto the RoA side of the primary berm. 0:15: What's this big, new form wall for? Could this be what the extra-long concrete pump crane was aiming at? Are they still adding concrete to that area of the shore? 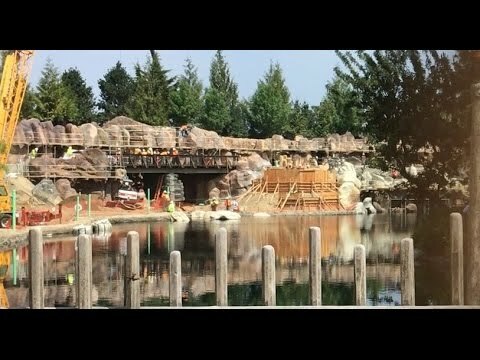 3:15: If they're adding gnarly (dude...) tree roots atop the highest rocks, does that mean that they'll be adding more rock work and/or a large, artificial tree, on top of that? 4:43: Happy workers. Say 'cheese'! Last edited by BiggestDisneyFan; 05-15-2017, 09:27 AM. Ha! Lincoln Logs... me n my kid brother loved them, my mom hated them (and Legos) bc of the vacuum jamming effect, and my dad would holler up a storm when he stepped on them, and Rover loved the loggy goodness of their texture. Yep, I know Lincoln Logs!! Anyway, BDF, excellent questions asked. I hope to see some answers, real or hypothetical!! When I get a chance later, I'll be watching the latest round of SILA vids bc some of the things you mentioned I have yet to see. Hmmm. Approval Glitched again. Sorry for possible double n triple posts in advance. me n my kid brother loved them, my mom hated them (and Legos) bc of the vacuum jamming effect, and my dad would holler up a storm when he stepped on them, and Rover loved the loggy goodness of their texture. Yep, I know Lincoln Logs!! Anyway, BDF, excellent questions asked. I hope to see some answers from everyone, real or hypothetical!! When I get a chance later, I'll be watching the latest round of SILA vids bc some of the things you mentioned I have yet to see, e.g. the scissor lift question. I think the scissor lifts are there to elevate the workers working on the rebar so they don't have to climb. I don't remember seeing them in previous videos holding up the frames. At some point they will erect another concrete form before pouring the concrete, so the lifts will have to be moved anyway. As far as I know there hasn't been any official word that the train cars won't be the same and the passengers pointing toward the river. Not saying people won't be looking backward....so maybe they will plant large trees or something to block the view. I was wondering the same thing. Could they be adding more walls to attach more rock work? Seems a bit late in the game for that.....unless they had to wait until other work was done first? They could just be creating retaining walls for dirt and will plant trees or shrubs there. I was thinking that it would just look like a fallen tree had been swept to the waterfall and stuck there.....kinda like how that is at the grizzly river run waterfall. I definitely had Lincoln Logs! Did anyone else have a 2XL? Are you forgetting that at least one of the trains has seats that face forward? Regardless, though, there is no way that Disney is going to give DLRR passengers get a healthy eyeful of SWL or give guests in SWL a good view of an old-fashioned Earth-bound train. Mark my words. There will be some form of berm between SWL and the tracks, all the way back to the Hungry Bear.